An English-language Chinese-French co-production filmed in Canada and China from Luc Besson and Robert Mark Kamen. It’s a film of quite contrasting visions. The tone is generally light and played for younger audiences, but the mix of fantasy and realism doesn’t quite work together. The story follows an American teenager from a single parent household who gets transported to ancient China via a giant mystical urn. 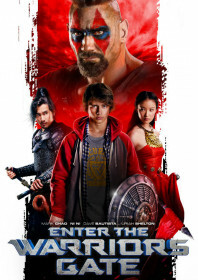 The boy has to rescue a kidnapped princess and defeat an evil tyrant – played by another American, Dave Bautista. The boy is a keen gamer, and you’re half-expecting him to be sucked into his computer screen, but that theme is never quite realised. His bullied backstory and single parent upbringing alludes to Kamen’s 1984 script for The Karate Kid, but that idea is also abandoned when a magical urn arrives and out jumps our ancient Chinese characters – played by Mark Chao and Ni Ni. The princess goes to the mall to learn about American consumerism and starts bonding with the kid, which is all rather sweet and seems closer to a fish-out-of-water comedy. Its the scenes in China which are the most incongruous, with a number of direct nods to Hero: showers of arrows, wire fu sequences, and epic vistas which are considerably more frosty in tone. This is when the film ups the fantasy elements considerably with magic potions, invisibility and a fight with a giant. What it mostly ends up resembling is the similar American-boy-in-ancient-China time-travel lunacy of The Forbidden Kingdom. Following his commendable turn as Drax in Guardians of the Galaxy, Bautista is given more room to inject personality into his grunting heavy. But the rest of the film feels particularly humourless, despite the best efforts of Francis Ng, who channels Jackie Chan‘s turn in The Forbidden Kingdom to play a dual role for comedic effect. Kara Hui also drops in for one scene, playing a spooky kung fu witch.